We supply new and used safes from all major manufacturers including Chubb, Burton and SMP. 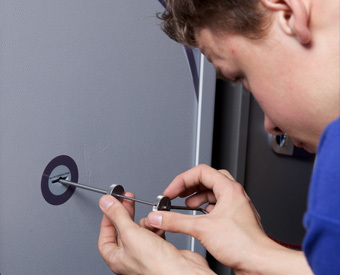 Our very experienced and qualified team are able to open or service any safe, whether it is locked through lost keys or combination numbers, or if you are unable to open your safe through a fault in the mechanism. If you are able to send us a photo of the safe, and describe the problem, we can give you a fixed price quotation to resolve your problem. Even if you can’t send a photo, we can usually identify the safe by asking you a few questions over the phone. We change key and combination locks for your safe. We would recommend that if any safe keys have been out of your possession for any length of time, if staff have left your employment, or if keys have been lost or stolen, that you change your safe combination or lock. Changing a combination number, including electronic locks, is a simple operation that will usually incur a call out charge only. Most of the above problems can be avoided with a regular service. Contact us for more information about our service contracts. If you are looking to purchase, sell, move or part exchange a safe please don't hesitate in contacting our team. If you need a safe moving to a new position or location, we have an experienced team of safe removers who will perform the safe move in a safe and efficient manner. We offer a safe rental service; simply let us know your requirements and we will let you have a competitive quotation. We can supply or build safe rooms for commercial or domestic premises aswell as panic rooms in houses. We will be happy to talk you through all aspects of your safe/vault, including bespoke details and added extras such as CCTV and electric locking systems.